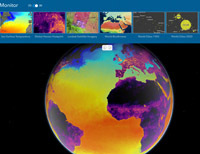 The new Earth Systems Monitor app, powered by Living Atlas data, showing Sea Surface Temperature. Redlands, California—Exciting new uses for GIS around the world were celebrated at the thirty-eighth annual Esri User Conference in San Diego, California, held July 9–13. Esri, the global leader in location intelligence, recognized users of the company's technology who are changing their organizations as well as the world around them. One particular set of innovations showcased were updates to ArcGIS Living Atlas of the World, the foremost collection of geographic information from around the globe. These updates included new data and capabilities for users to gain unprecedented insight for helping in decision-making as well as a more complete and dynamic picture of the world than ever before. Earth Systems Monitor—This new app (currently in beta) is powered by Living Atlas data. It allows users to see—on a 2D map or a 3D globe—historical, forecasting, and real-time data for depicting land, the oceans, and even the human footprint. Users can see where events or phenomena such as marine temperature shifts are occurring at any time on the planet, or even model global population growth and its effects. This configurable app will be released later this year. The app can be used with Living Atlas data layers or with other layers from an organization’s own data or ArcGIS Online. OpenStreetMap Vector Basemap—OpenStreetMap (OSM) is an open, collaborative project to create a free editable map of the world, built by a community of mappers who contribute and maintain data about roads, trails, buildings, restaurants, and more. Until now, OSM was only available as a raster basemap in ArcGIS Online. The new vector basemap, introduced in beta, will be available for free to all ArcGIS users and developers. 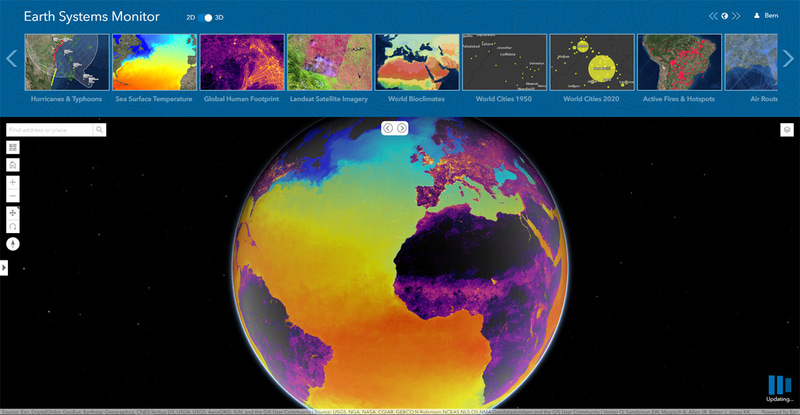 Wayback Imagery—This digital archive of the World Imagery basemap enables users to access more than 80 different versions of world imagery captured over the past five years. Each record in the archive represents a version of world imagery as it existed on the date it was published. Users can move back and forth in time and choose the imagery they want to use. "The Living Atlas shows how our community of users continues to contribute to the innovations that power our technology," said Jack Dangermond, Esri founder and president. "The beauty of these new features is that they transform the data that users are supplying into valuable online services like Earth Systems Monitor." Living Atlas can be used to create indexes displaying properties such as vegetation health or soil moisture and quantifying the changes over time, enabling better understanding of the environment. Earth Systems Monitor, OSM Vector Basemap, and Wayback Imagery are all examples of how online GIS technology is transforming traditional mapping organizations into web service providers. These innovations are just the latest steps in creating a living digital twin of the systems and processes that help run organizations, cities, and even nations. By fostering the adoption of apps, web maps, and collaborative efforts, Living Atlas is supporting end users who face increasing geospatial data demands, enabling them to be self-sufficient with the application of location intelligence across their organizations. Wayback Imagery is currently accessible, while both OSM Vector Basemap and Earth Systems Monitor will be available soon in ArcGIS Online. For more information, visit go.esri.com/LivingAtlasUC2018.